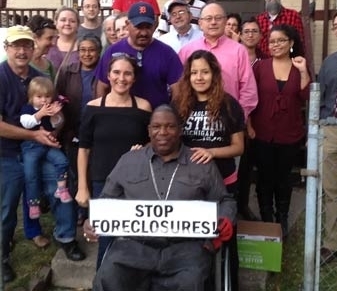 HomeForeclosures and EvictionsPicket, Weds., Feb. 19, 11:30 AM – Ficano: Keep Jerome in his home! Join Jerome in taking his case to the Wayne County offices. Jerome Jackson has been fighting his eviction for years while Wayne County Officials and Executive Robert Ficano have failed him, and many others in allowing homes to go into foreclosure. Everyone, including Wayne County, should be doing everything they can to keep people in their homes. We plan to remind them that we will not be ignored, and that Jerome Jackson has a right to a home. Keep Jerome – In His Home! Wayne County and CLS need to honor their agreement with Jerome and need to work with Fannie Mae to keep him in his home. CLS and Wayne county have the responsibility and ability to address this issue, but wont act. Join Us Wednesday February 19th at the Guardian Bldg! Jerome Jackson purchased his home in Inkster in 2004, as part of a nationwide Fannie Mae program targeting people with disabilities with predatory loans. Wayne County and Community Living Services convinced Jerome Jackson and many other people with disabilities, including Jerome’s friend and neighbor, Donald Moore, to buy a home on the promise that the government would provide ongoing housing assistance so that they could afford the monthly mortgage payments. Jerome Jackson did his part; he paid his portion of the mortgage each month. He made improvements to the home to make it accessible and invested in it because it was his own. He has lived there for 10 years now but without notice Fannie Mae, Wayne County and CLS, have pulled the plug on the program. They stopped making their payments, and have broken their agreement with Jerome. They’ve stopped all housing assistance payments and are moving to evict Jerome Jackson from his home. CLS, Wayne County and especially Robert Ficano have once again failed the people of Detroit. In our view they have only one option, keep Jerome, in his home.